Our medical negligence solicitors can help you make a claim. Manchester medical negligence injury victims get maximum compensation. The UK has one of the world’s best healthcare systems with internationally recognised standards. As such, most patients who are treated by either NHS or private healthcare services, whether in a hospital, dental surgery or doctors, they will be treated extremely well. Most patients won’t have any problems and will receive the highest quality of healthcare. However, for some patients things will go wrong and through error or direct negligence, patients might be injured or find their illness getting worse. In this guide, we will look at some of the most common circumstances for using a solicitor to claim compensation after being hurt by a medical practitioner. Failures to correctly diagnose medical conditions or wrongly diagnosing a condition. This may also include the failure to diagnose a condition quickly enough. Errors when carrying out a procedure, operation or the dispensing of medication. Errors in the prescription of treatment, medications or therapy. Medical practitioners not getting informed consent from a patient, or not fully warning a patient about any risks of being treated or not treated. 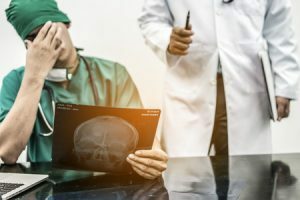 Patients who are looking to bring a medical negligence compensation claim will need to show that the treatment they received was carried out in a negligent way, or that it had significant negative effects on the claimant. Patients can also claim using a medical claims lawyer if the level of care they received was below standard. No matter the circumstances surrounding your medical negligence case, the first step is to find the best solicitors to work on your case. No matter where you are based in the country, our experienced, expert solicitors can get you the compensation you may deserve. No matter where you are based, there are lots of clinical negligence solicitors to choose from you can f ind out the best ways to choose a solicitor in Manchester below. One of the simplest ways to find a reputable solicitor is by talking to friends, family, and colleagues who may have previously needed to use a solicitor or asking for recommendations. Other common ways can include reading online reviews where you can find impartial feedback. At Legal Expert, we offer a trusted legal advisory service. We help to provide you with the best, experienced solicitors covering the Greater Manchester area. Like many professional services, thanks to the web, today you can find a plethora of impartial reviews of medical and clinical negligence solicitors from across the UK. online reviews have made it much easier to read, evaluate and compare a range of different professional services, such as Manchester medical negligence solicitors. Reading reviews of the different professional, no win no fee services, offered by solicitors can be a great way to compare the different services they offer as you choose which solicitor to work with. Try to compare the different service packages they offer, as well as looking at how different solicitors structure their fees and if they offer a truly no win, no fee service. Whilst reading reviews is a good way to learn more about legal services, it is not a substitute to directly talking to a professional. Email the team at Legal Expert today via info@legalexpert.co.uk. In the modern world, a whole variety of professional services can be provided digitally across the web by experts anywhere in the country. Whilst you may wish to use a solicitor in your town, you don’t have to use ones based in your local area. By using a combination of secure email and messaging services as well as video messaging applications, much of the work on your case can be carried out remotely. This means that no matter where you are located in the UK, the solicitors covering Manchester who are part of our panel can help claimants across the UK. If needed, your medical exam might need to be carried out close to you. These consultations could be needed to establish supporting medical information which is part of your claim. If you require an additional medical exam, your personal injury solicitor may be able to organize this for you. Whilst there are many different medical negligence legal firms helping people in Manchester, they will all offer you different levels of services and may be able to secure different levels of award from the banding for your injury. A successful claim award will be made up of two parts. The first part is general damages. General damages are awarded for the direct medical injuries. The second part of the claim is called special damages. This includes things such as loss of earnings and out of pocket expenses like travel costs or adaptations to a person’s home. The solicitors we work with have a high track record of securing higher claim awards in each banding. Different solicitors operating across Manchester will also have different fee structures. What Clinical Negligence Compensation Claims Do We Handle? The technical name for medical negligence is clinical negligence. You might often come across this term when researching how to make a claim or talking to your solicitors. We can handle a wide range of clinical or medical negligence claims types. These claims include situations where a healthcare practitioner has breached their duty of care. The solicitors we work with have the experience, skills, and knowledge to help clients who might be facing a wide range of medical negligence cases. Generally, these claims include circumstances where a healthcare provider, professional or worker (such as a dentist, GP, surgeon or care worker) has breached their duty of care to a patient. The solicitors we work with are experienced and dedicated professionals who have the skills and knowledge to help clients who are facing a range of different medical negligence cases. The solicitors who are part of our expert panel can help you to make claims against either of the main hospitals in the city, these include the Manchester Royal Infirmary and the Royal Manchester Children’s Hospital. Our clinical negligence solicitors covering the North West of England can help people who have experienced negligence as a result of care in the NHS or under private healthcare providers. Delays in a patient’s diagnosis or treatment. Incorrect or misdiagnosis of a condition. Cosmetic issues or those requiring restorative dentistry. Whilst most people are treated extremely well by their GP (another name for a doctor), it is possible that you feel that you have treated in a negligent way by your GP. If this is the case, you should talk to an experienced solicitor. Most GP’s won’t be specialists, but work in general day-to-day medicine. They will refer patients to other specialists who have the experience to treat a patient. However, in certain cases, a doctor might miss a symptom or fail to correctly diagnose a condition. This can be classed as negligence on the part of the doctor. If the negligence leads to a patient getting worse, or that they are not treated correctly, you may be able to claim compensation. The specialist cancer negligence compensation solicitors we work with are able to cover Greater Manchester, and can support you through the difficult process of seeking the compensation you deserve. We have experience in helping clients and their families to get the compensation they deserve. Our cancer negligence compensation claims specialists can assist with cancer cases related to mistreatment, misdiagnosis or delay in the diagnosis of a case. All of these situations can be considered to be negligent on the part of the doctors. Whilst most care homes and nursing homes will provide excellent patient care, this is not always the case. Some care homes have been shown to lack the necessary staffing, supervision, equipment or facilities needed to provide the appropriate level of care for the vulnerable, elderly or sick. If you believe that you, a friend or family member has not or is not receiving the expected standard of care, or being consciously neglected in a care home you may be able to bring a compensation claims case against the provider or staff members. Birth injuries medical negligence claims can be brought against a hospital or medical staff such as a midwife. These types of claims can be brought for injuries to the child or mother and may have happened during the pregnancy, whilst the mother was in labour or giving birth or after the child is born. These types of injuries can include; brain damage, cerebral palsy, and even stillborn cases. Talk to the expert solicitors today to find out more about birth injuries and birth injury compensation claims. At Legal Expert, we work with claimants and solicitors to help recover the compensation that people who have faced medical negligence deserve. We can support people in the city centre, the Greater Manchester area and across the country as a whole. Below is a table showing the number of incidents and claims made against Greater Manchester area hospitals. To make a claim, talk about our no win no fee compensation claims experts today. Legal Expert work with specialist no win, no fee solicitors covering Manchester, as well as across the North West and the country as a whole. We offer a guaranteed no win, no fee service with no hidden costs, fees or charges. If you do not win your case, you won’t be charged a penny for your solicitors’ services. There are no catches or small print and we make sure that you understand everything before you agree to work with us. You can find out more about using our no win no fee services in our guide. That the claimant was owed a duty of care by the defendant, as a patient in a medical practice or a resident in a care or nursing home. That the duty of care owed to the claimant has been breached. Finally, that the breach was caused by negligence. At Legal Expert, we work with a nationwide panel of medical claims lawyers and solicitors. We can work with you on a no win no fee basis, as well as providing you with expert advice. Our Manchester claims team can handle claims for private and NHS patients as well as for people who have been treated or resided in nursing and care homes after they have suffered from negligent treatment. The first step to take in making a medical negligence compensation claim is to talk to the specialist legal solicitors at Legal Expert. Our specialist team is on hand to provide you with all the information you need, whether you need more information on the personal injury claims process, or are ready to start a claim. Our phone lines are open seven days a week, ready to provide you with all the information you need when choosing a clinical negligence solicitor. You can start your medical or clinical compensation claim by talking to Legal Expert today via 0800 073 8804. Claimants can also contact us by email including the details of your claim and request a callback from our experts.